The premise of the well-known American drama The Glass Menagerie by Tennessee Williams centers around single mother Amanda Wingfield, her oldest son Tom, and his little sister Laura who have found themselves in a financial squeeze since only Tom is able to work. Out of desperation, Amanda decides to try and set Laura up with a “gentleman caller,” a man from Tom’s work named Jim. What differs in this production is the centering of people of color and women in the casting of the play, a point of artistic pride for director Lisa Portes. Amanda and Laura’s predicament doesn’t come across as the result of a debutante who doesn’t believe women should toil, but rather a societal limitation imposed by the times (the play is set in St. Louis in 1937). This increased my empathy for these characters ten-fold. The Glass Menagerie is a play I read and loved, but quickly shelved because I didn’t want to get too attached a play in which I’d never be cast. 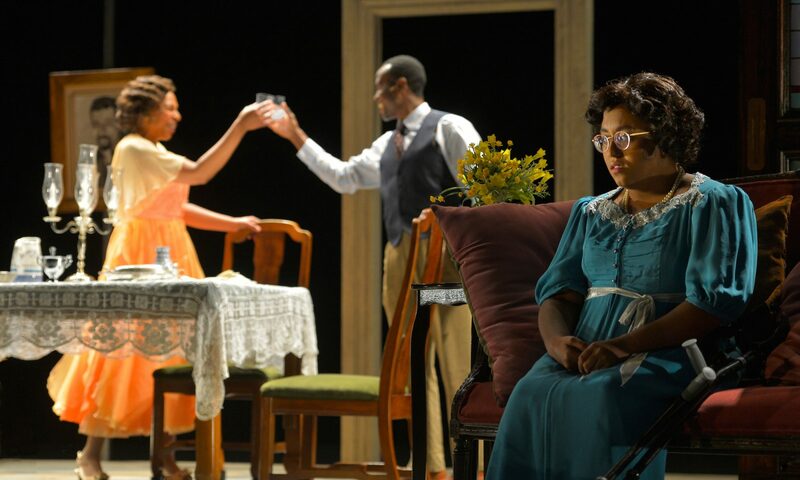 This is why Lisa Portes’ direction of The Glass Menagerie at Cal Shakes is so essential for children of color to see, and within the first five minutes I was envious of all the young people and students who will see this play and never question their place in it. Tom, played by Bay Area legend and Campo Santo Co-Founder Sean San José, is the first character we see. As narrator and character, he is the crux for most of the movement in the play, master of this dream universe, and guides the moving furniture around the space. These movements increase in difficulty and attention as the play moves forward, which creates the feeling that this memory play and this family is only held together by Tom’s sheer effort. This made me pay attention to Raquelle Baretto’s costume design – they have put together easy to wear and move in pieces for the artists that are elegant and often striking. The opening design and staging of the play is a wonderful duet between costumes and lighting (Xavier Pierce) that lives in a moment beyond time. Baretto makes use of Laura’s affectionate nickname “Blue Roses” by dressing Laura in a sweet patterned dress covered in blue roses. Sean San José’s gentle depiction of Tom creates a generosity of spirit this character is usually denied. This pays off when Tom breaks the menagerie animal, he finally becomes frustrated and dangerous in his ability to hurt the family. At particular risk in this play is his differently abled sister Laura, played by New York based poet and activist Phoebe Fico. Fico makes a striking and elegant stage debut as Laura, and we empathize with her at every turn. Laura is a character that I’ve usually seen played with a debilitated spirit, but Fico’s Laura is full of endearing smiles and sweet quips that make her moments of devastation hurt even more. Phoebe Fico sparkles in her acting debut, and deftly works the broad Cal Shakes stage with an inherent grace. I could tell it was her debut – if only because everyone else onstage is so seasoned – yet I found myself completely forgiving the absence of technical training in exchange for the genuine light that exudes from Fico. I support Cal Shakes’ decision to debut a new actress on an equity stage. A tradition of the past, it is incredibly rare to do so now, but the risk paid off tremendously. Karen Aldridge gives a hilarious and warm tour de force of a performance as Amanda. When attempting to get Tom to bring home a gentleman caller, she hollers at him from the front porch as he traverses through the audience to get to work, eventually eliciting applause from the audience at the end of this scene on opening night. A particularly slick bit of directing from Lisa Portes and Aldridge’s animated demeanor gives life to a typically dull scene: Tom describing Jim, the gentleman caller to Amanda. Tom and Amanda move together to construct the full parlor including hanging windows and arranging the dining table during this exchange, giving it buoyancy. The set, designed by Annie Smart, is bare and simple but surprisingly flexible. One of the most difficult things about the Cal Shakes space is how to define it. Each designer and director has to decide where the limits are for their world and build something to illustrate that, and though you can’t cover the forest landscape you can decide how to utilize it. In this design, a huge frame gives us the context of the home, and it worked in pulling my focus to the center. As it got dark I don’t particularly recall seeing the forest and even when it was visible it felt more like looking through a window. Rolling and hanging furniture is slid into place during the play, and the worst thing I have to say about it is that I was so struck by its compositional beauty I thought it was all a bit too nice for the financially challenged Wingfields. However, it’s a memory play, and who complains about things being unbelievably pretty? As the set comes together and time marches on, the gentleman caller advances, and his entrance is beautifully highlighted by Brendan Aanes’ haunting sound effects. When we are thrust into this romantic memory by the arrival of Jim, the effervescent Rafael Jordan, a truly magical feat in the field of lighting is delivered by Xavier Pierce. He gives us parlor candlelight, despite the fact that we are outside and it’s dusk. It’s gradual and does not try to pretend that we are not outside, which makes it feel even more real once the light cue settles. I gasped, and everyone outside the show was talking about that visually stunning moment. The Glass Menagerie is a stunning memory play and a must-see experience at the Cal Shakes Bruns Amphitheater. It runs through July 30th! BIAS ALERT: This writer worked for Cal Shakes in various capacities including understudying, ending in 2016.